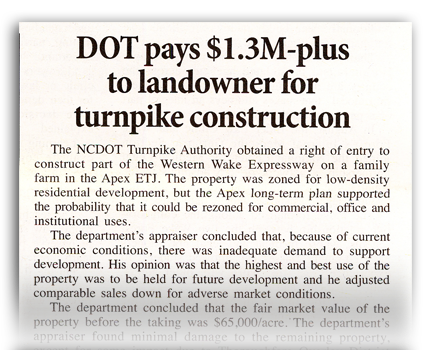 The NCDOT Turnpike Authority obtained a right of entry to construct part of the Western Wake Expressway on a family farm in the Apex ETJ. The property was zoned for low-density residential development, but the Apex long-term plan supported the probability that it could be rezoned for commercial, office and institutional uses. The department’s appraiser concluded that, because of current economic conditions, there was inadequate demand to support development. His opinion was that the highest and best use of the property was to be held for future development and he adjusted comparable sales down for adverse market conditions. The department concluded that the fair market value of the property before the taking was 65,000/acre.” The department’s appraiser found minimal damage to the remaining property, except for some impact due to Thoroughfare Overlay District restrictions and an isolated 0.20 acre remainder. Mrs. Fahey’s appraiser concluded the highest and best use of the property was for residential development. In addition to the damage to the small landlocked remainder and damage caused by the Overlay District, he found that the remaining property was significantly damaged by its proximity to the new six-lane highway, which would be elevated as much as 26 feet adjacent to the property. Case number: Settled before condemnation suit was filed. The information in Lawyers Weekly’s verdicts and settlements reports was submitted by the counsel for the prevailing party and represents the attorneys characterization of the case.